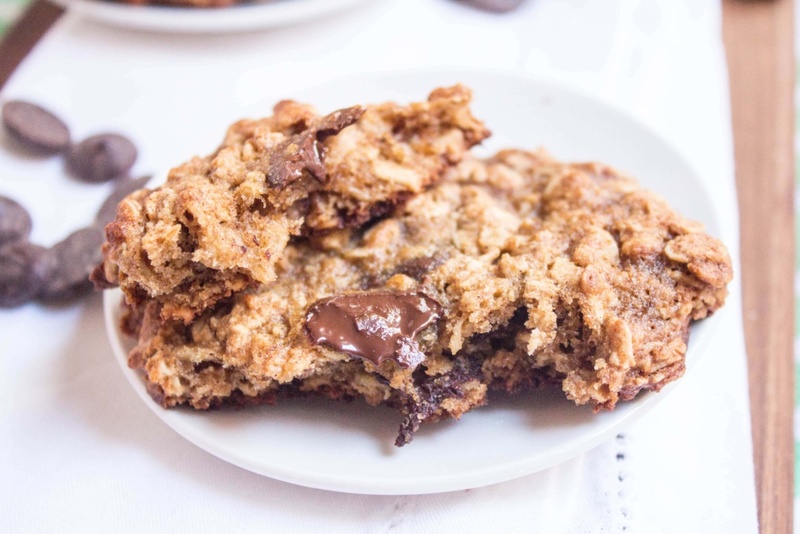 These gluten free chocolate chip cookies are so easy to make! 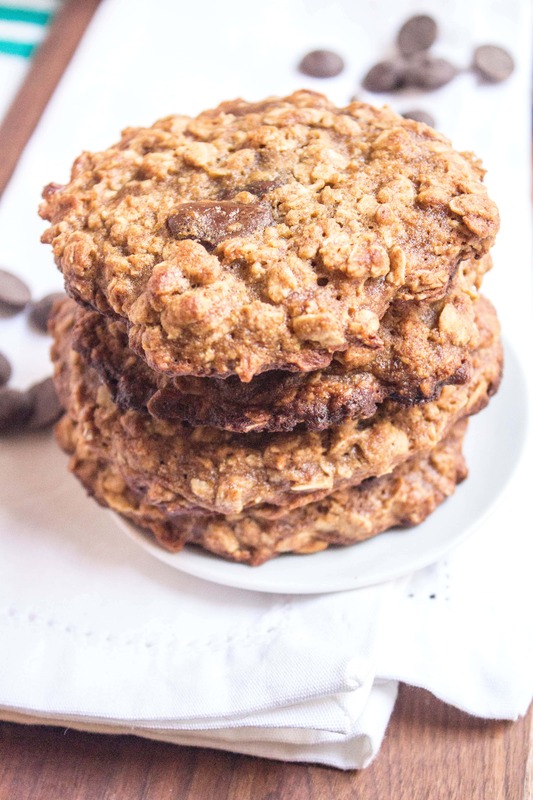 Plus – they’re healthier than your usual cookies, without sacrificing that crispy-on-the-outside, chewy-on-the-inside texture. Enjoy! Don’t let chickpea flour (which you can find online or in health food stores) freak you out — I promise you can’t taste it at all. Matt was SHOCKED when I told him that the cookies he was currently demolishing had beans in them. ;) Just don’t taste the raw batter! 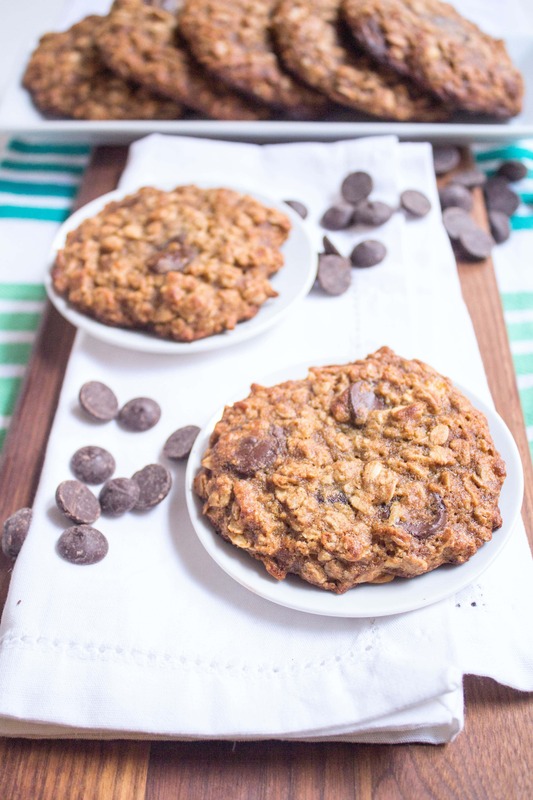 These cookies are hearty and flavorful — I love the hint of coconut and banana and there’s no bean flavor, I promise. Just a little extra sneaky protein in the form of chickpeas. :) So healthy you can eat them for breakfast — and we have been! *If you need this recipe to remain gluten free, be sure to buy oats and walnuts that are certified gluten free. Both are naturally gluten-free but can often be contaminated in processing — just a heads up! 1) In a large bowl, mix all dry ingredients. In a separate bowl, mix all wet ingredients, except for the walnuts and chocolate chips. 2) Add wet ingredients to try and mix. 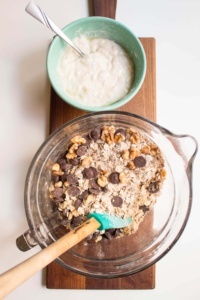 Add in walnuts and chocolate chips and mix. 3) Grease or cooking spray two baking sheets. 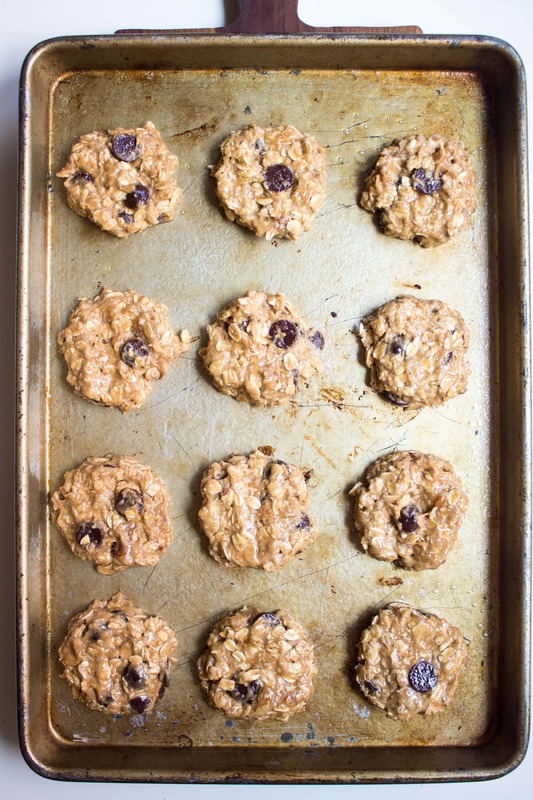 Use a spoon to form the batter into uniform sized balls and drop them onto the baking sheet evenly spaced. Press the balls down a bit with the spoon. 4) Bake ~12 to 15 minutes (check to test doneness). Deeeelish. My official taste tester (Matt) gave them two thumbs up! Next article: Track Workouts Are Back! I’ve made a ton of wheat-free baked goods using chickpea flour, and my boyfriend can never tell. 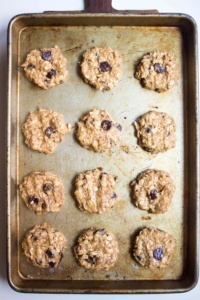 For each cup of wheat flour, I use 3/4 cup chickpea flour, 1/4 cup almond flour, and 1/4 cup cornstarch. To save money, I make my own chickpea flour and almond flour. Of course, he just might think they taste good because I use outstanding chocolate. Hard to say. Yay I hope they are a hit! 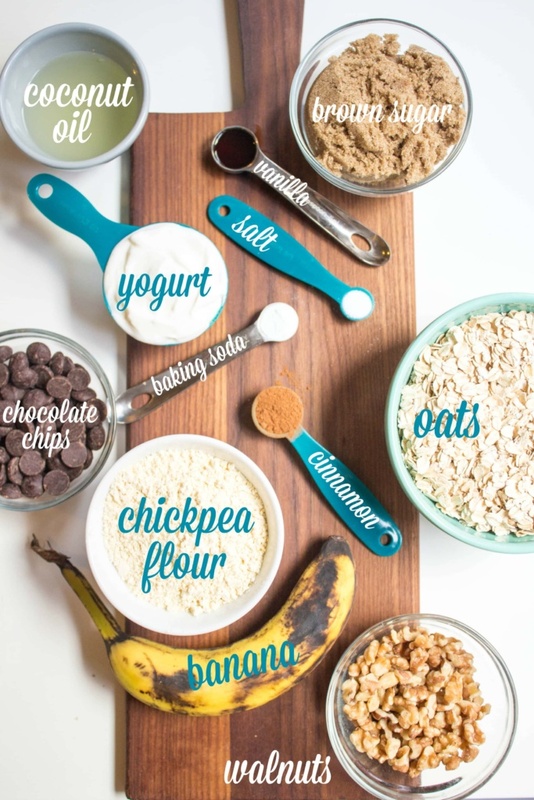 Looks like a yummy cookie recipe! I saw the garbanzo bean flour in the store the other day and thought to myself….hmmm?? I love that blue cup! Where did you get that? I honestly don’t even remember – I’ve had it forever! I use that flour all the time because it’s one of the cheaper GF flours I’ve found and I love it! These look great! Can’t wait to make them! Is there something I can use instead of coconut oil? You can use canola oil, but then you won’t have the awesome coconut flavor! Nice! I’ve had some altercations with garbanzo flour causing me to have some funky tasting cupcakes, but this looks promising. Now to find some GF oats in South Africa… Should’ve brought some back a few weeks ago! Haha “altercations”… I love it. Yes sirree, my mouth is drooling. I have a UMW Circle meeting Thursday morning and these will surely be a hit. I am baking them as we speak! I didn’t have garbanzo flour, so am using a whole rice flour I had in the pantry. I also added a bit of cranberries to the mix and they look amazing, even as dough! Can’t wait to try them as soon as they cool from the oven. Thanks for the recipe, it was quick to whip up! I am so excited to try these!! I bought garbanzo bean flour a while back and I couldn’t figure out what I should do with it, particularly so it wouldn’t taste like garbanzo beans :) These look delicious and healthy. Thanks for the recipe! Chickpea flour? What an awesome idea! Hi! I’ve now made these twice and they are delicious! The last time I replaced the chocolate chips and walnuts with almond butter. Yummy! Oh and I also added chi seeds for an extra shot of nutrition! Elisa — we’re making theses again! YUMMY…. Glad they came out okay despite all the substitutions! These really are delicious! I used chocolate chips, raisins, & walnuts. . . I cant find chickpea flour, can i buy a bag of dry chickpeas and grind them fine? I’m honestly not sure! Maybe? Try it! I’m sure a heavy duty grinder would work but I’m not taking any chances again. If you have an Indian market near you, it’s also called Besan or Gram flour. It’s MUCH cheaper than grocery store or natural food market prices. If you wish to grind it, I’d try a coffee grinder. What a healthy, tasty treat! Hi, What can I substitute the yogurt for? You could try pureed avocado! I bought chickpea flour to make Indian breads. 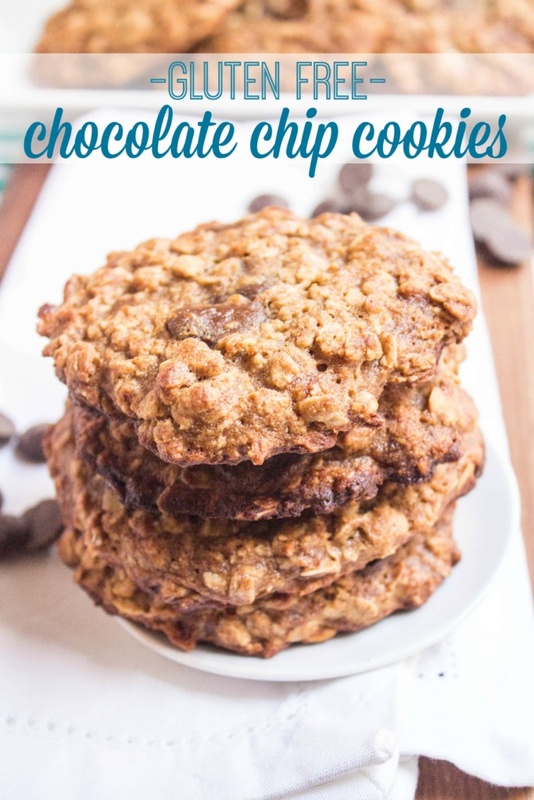 However, I was hunting for more versatility and then I came across this recipe to make chocolate chip cookies. Thanks!!! They are delicious!